Most people today are familiar with the term “hoarding”. Whether it’s from television or every day conversation, the word gets thrown around often. It seems especially common in the online plant community, including hashtags and usernames. #Houseplanthoarder is honestly something I tag in my own Instagram posts. So why am I bringing this up? Because I’m a, we’ll say recovering, actual hoarder. And I don’t think that my collection of over 50 houseplants is completely removed from that. If you’ve watched the TV show Hoarders, you can envision what one of their houses look like. I grew up in a similar environment. My dad is a hoarder and my mom is overworked and without the energy to deal with it. I certainly contributed to the situation myself, as some kind of mix of nature and nurture. Moving out of that environment when I was 19 didn’t stop my habits or the way my brain is wired. Luckily my first roommate was a heavy cleaner and made up for a lot of my messiness. However my next roommate was in a rough depression during the two years we lived together, and not unlike my mother, didn’t have the energy to clean or deal with my tendencies. When he moved back with his parents after college, I stayed in that house and let it get worse. As some sort of deep karma would have it, my partner of almost 9 years grew up in the same situation. His mom is a hoarder, their house that he lived in until we got married looks like the Hoarders TV show, and that same nature/nurture concoction has given him hoarding tendencies. He’s especially adamant, however, that we will not end up like our parents. We purchased our first home in November, and we’re trying our hardest to overcome our bad habits. I mentioned earlier that I consider myself a recovering hoarder. A combination of deep personal work, friends who can lead by example, a partner holding me accountable, anxiety medication, and a desperate need to live a healthier life than my parents have allowed for a lot of healing. But it’s still a part of me. When I go plant shopping at the nursery or online, I’m flooded with endorphins that sometimes turn to shame. I’ve written previously about how caring for plants can help your mental health, and I truly do believe that. 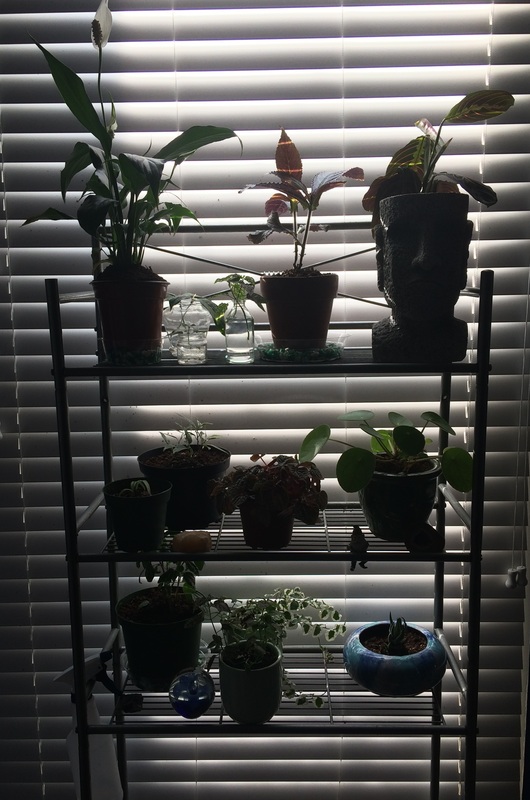 Being around my plants improves my mood and relieves stress and anxiety without a doubt. And I would love to turn this into my career, eventually having my own nursery. However, there’s a fine line to walk and make sure I’m not over doing it. Having mental health disorders can blur those lines in a way that abled people don’t have to worry about. When people casually throw out the term “hoarding” it makes me cringe. It’s such a huge part of my life and something that holds a lot of shame and stigma. But for some reason when I’m using the hashtag #houseplanthoarder I’m not cringing. Maybe because it feels accurate, like a cute way to place a shameful label on myself. Is hoarding something you’d like to read more about? Feel free to let me know in the comments. I could (and probably should) write about it forever. I, too, very much enjoy my house plants. I have three in my apartment now and three smaller plants in a terrarium. I used to not have much of a green thumb, but now I pride myself for taking care of my plants with every new leaf they grow. I think it’s a great idea to turn your passion into a business- start a nursery, or grow a vegetable garden. Then you might not look at them so much as clutter. Although i don’t qualify as a hoarder of house plants, I see how easily people could get ensnared in plant collecting. There are so many types, they are so beautiful, and the care is low-cost (somewhat…soil, new pots and fertilizers could probably add up). Thank you for the feedback, Jess! 🙂 I try not to think of my plants as clutter, but also to make sure they don’t become clutter, if that makes sense. Best of luck with your three plants and terrarium! It is indeed very rewarding to see new leaves growing. Large collections whether stamps, bottle caps, or plants do not necessarily constitute hoarding. There is a big checklist of conditions that go with hoarding. So while I very much appreciate your caution to avoid hoarding I also wish to respect the context and definition of words like hoarding. Words like purpose, balance, and safety also figure importantly in the discussion. That being said it is an important subject to be aware and discuss. As to 100 plants being hoarding I will let you be the judge. I will just say been there, done that, almost all of my plants are outside now. But that is mostly a different subject. I am glad you find purpose in your plants. Yes I’m very aware of the checklist that goes with hoarding, and the whole purpose of this post is me saying people throw around the term “houseplant hoarding” while not understanding what makes someone an actual hoarder. I have lived in conditions that meet the criteria for hoarding, have been in therapy for it, and it’s an incredibly sensitive subject for me. I don’t think having 100 plants is necessarily hoarding, but that is the term people use on the internet for it. And this is me talking about how I feel like I’m walking a line and not able to collect things the way a neurotypical person can because I am an actual hoarder. I do hope you found my comments supportive to what you have stated here. I did not mean them to be critical in any way. And do not pay any attention to someone who uses the term with nothing more than a count to justify their opinion. I hope your plants continue to bring you much pleasure. I find the garden to be a great balance to the noise of the fast paced world. Thank you for your thoughts.